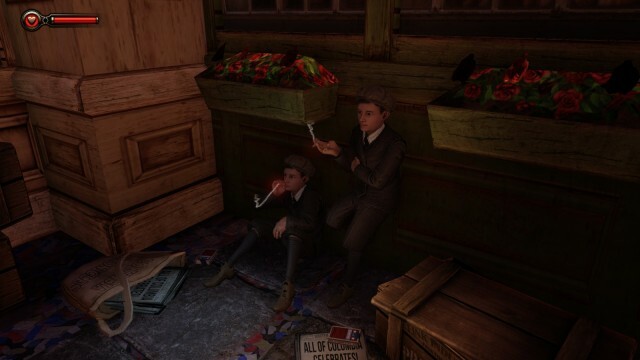 Bioshock Infinite is a great game. You may remember that I had mostly positive things to say about the original Bioshock game. I have never played the sequel, because to be honest, it seemed like an incredibly stupid idea at best, or a worthless greedy cash-in at worst. Still, if it helped to fund this game, I begrudgingly acknowledge it’s existence. 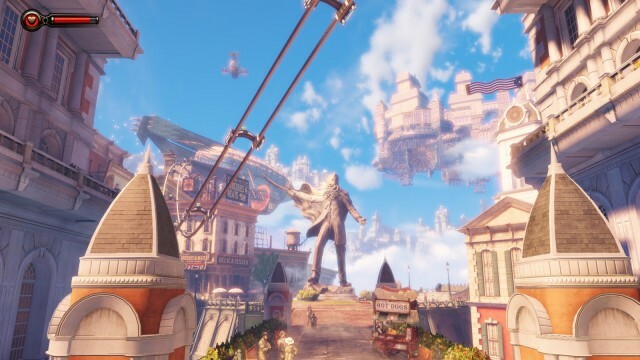 Bioshock Infinite has exceeded it’s predecessors and at the same time my wildest expectations in every possible and imaginable way. It has been quite a while since a video game had this sort of impact on me. When the final credits started to roll, I felt a visceral catharsis – I have experienced something exceptional. This usually only happens to me after I watch a good movie or read a good book. Few games have actually elicited this soft of response from me. It is an incredibly well put together product and it deserves all the accolades it is getting from video game enthusiasts and reviewers. I have quite a few things to say about this game, so I figured it is best to break them up into several posts. Today I want to talk mostly about the visuals because they are what gives the game the strikingly original appearance. This might probably be one of the least impressive screenshots from the game, but to me this was the instant I knew this will be a great experience. There is a lot of little details that make this scene come together so bear with me for a second. Firstly, you should note the ever popular orange/blue contrast. There is a reason why it is so overused in movie posters and commercials – it looks great. Here it is very subtle contrast between a light emitted from a light-bulb in the distance and moonlight shining through the window. You only really see it when you first walk into the room, but it clearly shows someone took time to set up the lighting just the right way to give you this striking contrast when you take in the surroundings for the first time. But this is just the tip of the iceberg. Note the the trail of blood which leads your eyes to the body in the chair. Note the scattered books on the floor and the bullet holes in the glass on the right indicating some sort of struggle taking place in this room. All of these details where painstakingly assembled and placed at the right spots to tell a story. In a lot of games, scenery is just an afterthought. It is just some industrial backdrop and/or rubble that the artists slap onto wall textures few hours before you rush the game out the door. 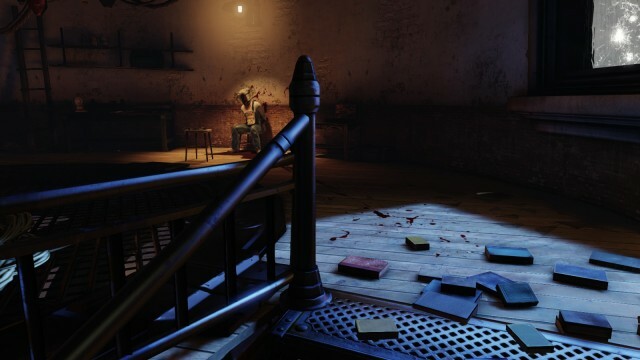 In Bioshock Infinite it is part of the story – it is the way the game sets the mood and tells you about the world. Not only does it look great, but it tells you just about everything you need to know about this place. 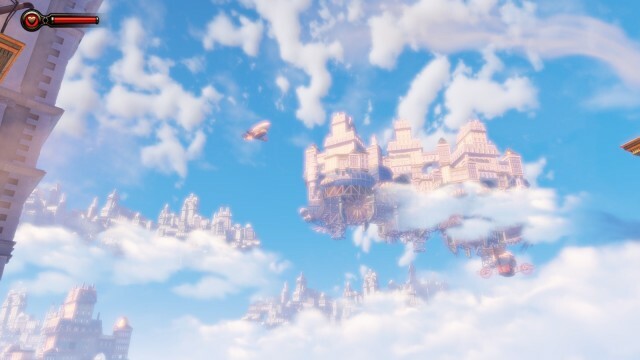 You clearly see it is a floating city in the sky. You get a really good glimpse at the no-classical architecture, the ubiquitous flags on the rooftops giving you a pretty good first impression of what this place is like. To reinforce the idea that you’re “not in Kansas anymore” you see a few dirigibles flying by. Now dirigibles are or course one of the main modes of transportation in the flying city, but they are also the universal symbol of other-wordiness. It is part of our visual vocabulary that screams “you are now in the Twilight zone”. Whenever you want to make a story about different dimensions or alternate histories, the easiest and fastest way to communicate this to the viewers is by putting dirigibles in the sky. 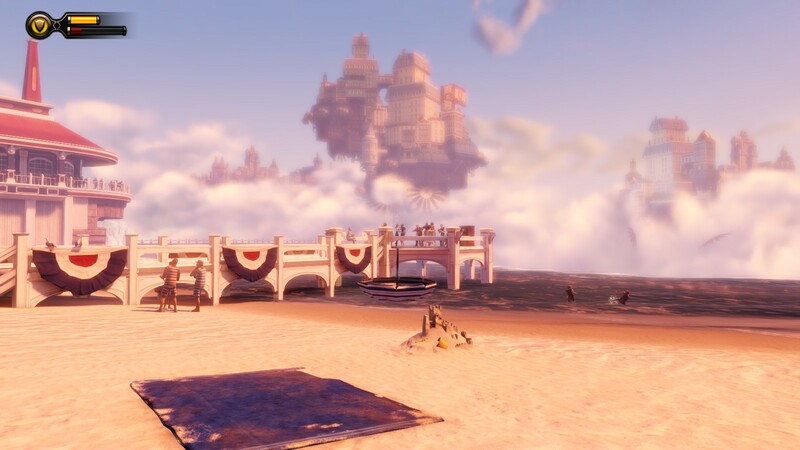 And Bioshock Infinite does this almost immediately, illustrating quite clearly that the art director was well versed in the evocative use of visual tropes. Also note the angel statue in the center of your vision. It is a striking piece that not only provides a lot of hints about the nature of the place, but also is an important landmark. The player subconsciously make a note of it, expecting to see it again from up close. Later becomes an important objective, and even though you don’t know the layout of the city that first glimpse at it still lingers in your memory. This is a brilliant touch because it gives you a reason to want to reach it. You are not going to that statue just because the game told you to, or because it is your mission. You actually want to go there because you want to see this thing from up close. You have some idea of it’s impressive scale and awesomeness so you want to check it out. And on your road the game teases you with glimpses of it, be it on posters or those movie rolls you find throughout the city. The closer you get to it, the more tantalizing it becomes, and the more you realize the truly massive scale of this construct. It becomes this looming, magnificent thing that you just need to reach. And after taking so much time and effort to find it, you can’t help but feel sad when it gets severely mangled during the escape sequence (regardless of what was going on within). I haven’t taken any screenshots inside the church/temple where you pod lands, but that was another incredibly evocative and well designed area. Selling a setting such as Columbia might be rather hard. There are a lot of things that you need to let the player know. A lot of games deal with this via narration or information dumps provided by NPC. Bioshock Infinite just has you walk through a series of candle lit shrines and absorb the information about the Prophet, the religion of this place, the attitudes of it’s citizens and etc.. No one really says anything to you – you mostly gather information visually. This is the first thing you see after you leave the shrine is this impressive vista. Once again note the striking orange-blue contrast in full effect. In this particular snapshot you can see not one, but two dirigibles which are important symbols that reinforce the otherness of the city. The focus of the scene is of course the statue of the prophet, surrounded by gawking citizens showing you that he is a beloved and respected figure in the city. The city square that surrounds the statue is full of stores, and street vendors and the crowd includes couples of lovers or spouses. This is significant, because the introductory sequence had you march through a church full of praying pilgrims in white robes. Seeing this seemingly normal crowd mulling around in the streets lets you know that not all citizens are pious, robe wearing religious extremists. You also get a good glimpse of the skylines and their function. If you have seen any trailers of the game, you know you will eventually be able to zip around on them. If you haven’t, you probably start to hope they will become available as a mode of transportation for you. There is a father carrying a child on his back – a very, very evocative symbol of positive values: fatherhood, family values, safety. You also see boys splashing around in the water from a street hydrant, blissful and care free. It all builds certain image of Columbia. One that is going to be slowly torn down throughout the game. The facade does start to crack pretty fast actually, but at first it mostly seems like an amusing satire. For example, I rather enjoyed this ridiculous little detail: a couple of kids smoking cigarettes in the corner. It’s funny, satirical but it also kinda off-putting. I believe this is the earliest crack in the idyllic facade you encounter and its a subtle one. It is something you can chuckle at, and not as insidious as the blatant, dehumanizing racism you are exposed few minutes later. It does however work well to prepare you for the future revelations about the true nature of this seemingly wonderful city in the sky. 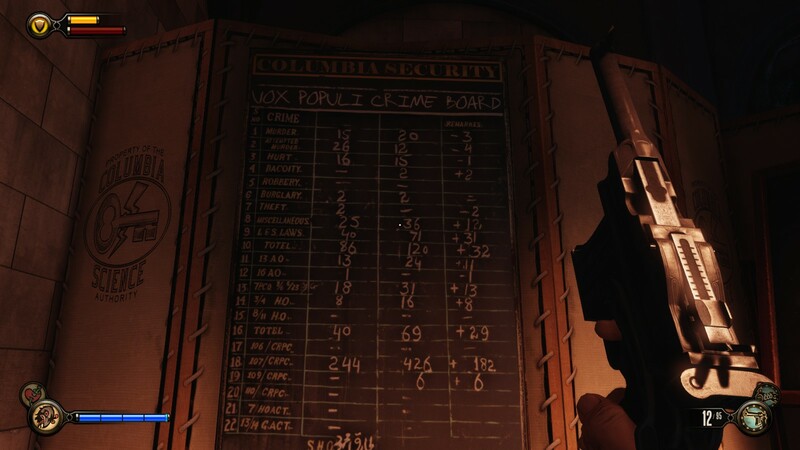 It tracks the various infractions committed by the Vox Populi faction (whom I by the way expected to be the good guys, but more on that later) which gives you a pretty good idea of what they are about. You will note that they have not committed any robberies or acts of dacocity (eg. banditism) and are guilty of very few burglaries which paints them as primarily political criminals rather than common villainous thugs as represented by the state propaganda. Look at the vibrant colors, and the amazing detail of the floating buildings in the distance. Look at the little sand castles, people splashing in the water, dancing and sun-tanning. It is really a charming little location full of really great scripted events that are subtle and yet add so much to the look and feel of this place. For example, at one point when you emerge onto the beach there is a string gust of sea breeze which carries sand and a beach ball across your field of vision as kinds pounce towards the shore in the distance. It is a little thing – completely meaningless in the grander scheme of things, but it really sells you on the whole beach idea. If you have ever been at the shore, you know those gusts, and how they are an inseparable part of the beach going experience. A lesser game would populate the beach with enemies and have you fight through them to get to your goal. 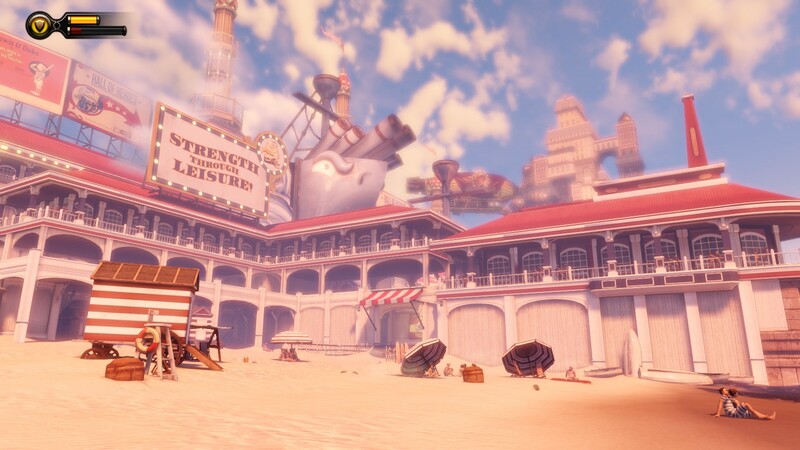 Bioshock Infinite does not do that – it lets you explore and absorb the atmosphere without forced combat. This is one of the things that always bothered me about the first Bioshock game – it never really gave you a break. From the moment you arrived in Rapture you were accosted from all sides by violent splicers. You always had to be on your guard, and always expected a sudden ambush. This was of course intended – the game wanted you to feel alone, pursued and scared. But whenever a game does that, combat fatigue sets in pretty quickly. A player can only operate in the twitch-kill mode for a limited amount of time. After a while constant combat becomes tiresome and you start to crave a break in the action and some exploration time. Unfortunately once you cleared an area in Bioshock it became a lifeless, sad and depressing place. 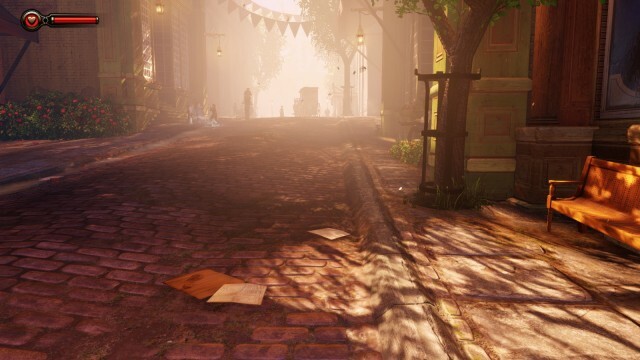 Bioshock Infinite gives you these vibrant, interesting and lively levels you can explore. They are full of color and interesting details and sound bytes for you to take in. It makes for great interludes between the combat sequences. This is pretty much the first thing you see when you arrive on the Battleship Bay and right of the bat the game gives you hints about your objective before you even know what it is going to be. The name of the place contains the word Battleship and you can actually see said ship in the distance. When it finally becomes your primary objective you have seen it enough of times in the sky to be really familiar with it, and really eager to reach it. It is like with the statue in the first chapter. They show you the carrot first long before they start to dangle it in front of your face. This makes the game flow so smoothly and makes the transitions between objectives so damn organic and seamless. In the original Bioshock you mostly did things because you had to. Either because Fontaine asked you to do them, or because they were the only available path of progress. The game felt incredibly linear because of that. 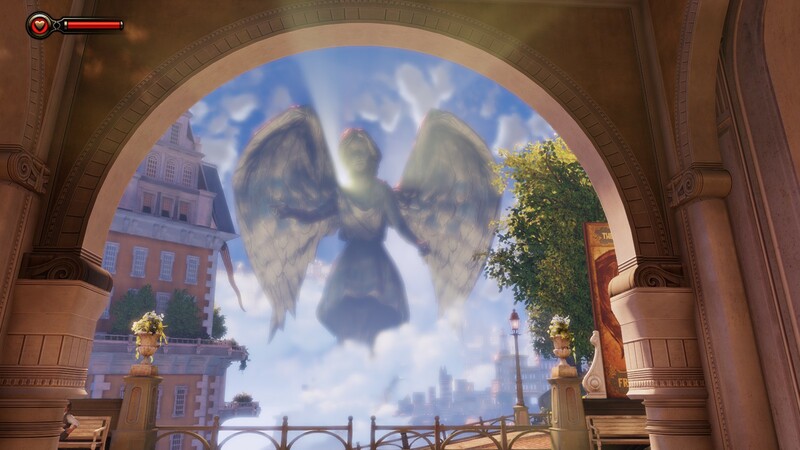 Bioshock Infinite is just as linear, but you have a real sense of agency. Why? Because the level design ensures that your goals as a player (check out the huge statue, find where that battleship is docked, etc..) always coincide with the goals of the protagonist. It is a little thing but it counts. 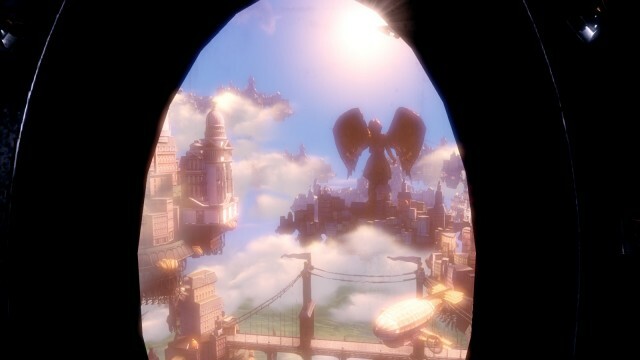 One of the things I hated about the original Bioshock was how empty the Rapture felt. It was populated almost solely by insane and violent splicers, and the few characters who seemed at least borderline sane didn’t really exist in the game world. We mostly interacted with them via radio or in cut scenes. The only non-violent character model we actually got to talk in person was Andrew Ryan, and even that turned into a blood-bath rather quickly. 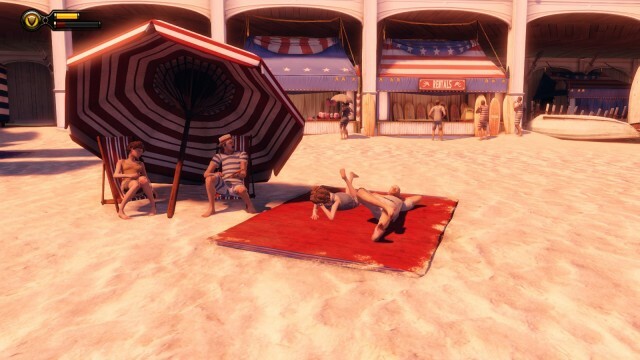 Bioshock Infinite is filled with NPC’s who just provide background. They mill around in the city, they have conversations on which you can evesdrop and they make the place feel alive. There are quite a few scripted evens in which the in-game crowd will react to some event, like in the screenshot above. I love the fact that the game did not wrestle the camera from me to show me the scene that freaked out all these citizens. I was free to look around at peoples faces, and observe their reactions while I was walking around among them. And yes, I posted a picture of Elizabeth here but let’s not talk about her yet. The next post in this series is going to be all about her so we can discuss her character in detail. Aah yes! I was hoping you’d do this Luke. I’ve finished BI just last night and its been one hell of a ride. This is my first day purchase in a very, very long time and it was well worth it. I spent the first few hours simply looking around this gorgeous environment. Indeed the game lures you, the fair (cleverly implemented tutorial) makes you long for more. The levels scream at you to explore them. The imagery and artwork is stunning, like you said, fantastic characters. But I was also very impressed by the enemies. The raven, handymen and masked creatures in the asylum. Motorized patriots really creeped me out! I have to admit I’m not really good at the frantic combat you’d have to employ but in the later game I did come to enjoy it immensely. The other good combination was ravens + shotgun. It’s probably worth mentioning I found the salt-drop gear very early on, and from that point I was maxing my salts stat before everything else just so I could spam vigors. So mid game I could pretty much continuously suppress groups of enemies with ravens, then waltz on over and take them down with shotgun from point blank range. If the raven attack timed out before I was in position I would spam it again because I knew that most dead bodies will have salt vials to replenish me. Really glad I can finally read all the cool articles, reddits etc about the game without spoiling the story! Great post, really enjoyed reading this. I too was totally impressed by the effort that’s gone in to how Infinite *looks* (some would – and have – argued that that effort has possibly been to the detriment of how Infinite *plays*). I ended up writing a post (here be SPOILERS) pondering if it was possible to apply auteur theory to the game as a result of that level of effort, but it actually started life as an analysis of Infinite’s opening and how it compared to that of BS1. All those little touches that are common to both games, the bathysphere porthole vs the window of Booker’s capsule, the squid vs the dirigibles. One thing I also noticed was how, when Booker descends into the Welcome Center, the religious imagery/messages shift quite abruptly to something rather more hellish: red lights, clanking chains and machinery… and then that shifts again to the stained-glass mural of the Comstocks with their lamb. 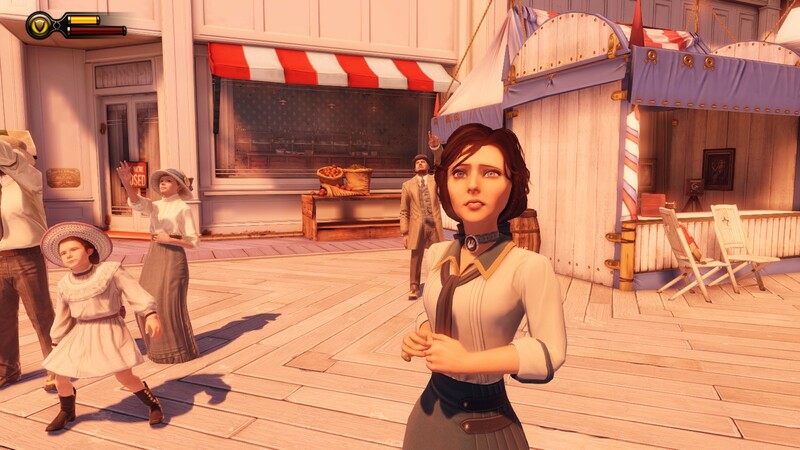 To be honest, something that keeps bugging me with this game is that, why on earth does Comstock need to go back to the past to buy Anne from Booker? I mean, BEFORE he took the baptism, Booker ALREADY has Anne, right? So that means, before Comstock took the baptism, he already has Anne. That’s really confusing for me. Not to mention, if Comstock is born AFTER Booker took the baptism, then why Comstock exists before Booker took the baptism in order to take his child? And then, i’m trying to digest the storyline of this game a little bit further and i found that, i think everything in this game happens in the current event. So it doesn’t require Booker to take the baptism in order to let Comstock exist. So everyone can exist in many many infinite realities and timelines.